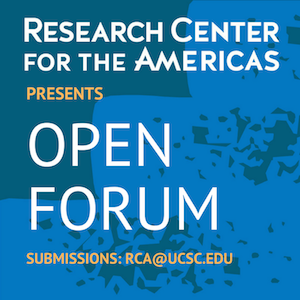 RCA’s Open Forum presents scholarly dialogues and commentaries from RCA affiliates and supporters on focus areas of interest to the research center. The focus areas include, but are not limited to, the following: Latin America; politics of California; citizenship; immigration/migration; mobility; social movements/activism; research(er) reflections, the arts, human rights, and feminisms (transnational, women of color). If you are interested in proposing a submission, please email rca@ucsc.edu for more information. If selected, your submission will appear in the RCA’s quarterly newsletter, social media, and on the website. Submission: 1K-2K words, 12-point font, single space. The deadline is agreed upon in advance between the author and the RCA director.